Around about 4pm this afternoon, I saw 5160 and 323 on Maroondah Hwy, heading towards Mitcham, school runs perhaps? Unlikely I should think as it is the second week of school holidays, unless some of the private schools have gone back early? Oops of course, always forget it is the school holidays, scratch that thought, must of been driver training or something. Brain fade strikes again. Transdev bus 163 (Scania/Gemilang) has entered service, seen on a 902 to Chelsea near Doncaster depot around 6pm. Gemilang/Scania bus 158 has entered service was seen operating a Eltham rail replacement express service on Tuesday morning (did not see rego). BluDART wrote: Gemilang/Scania bus 158 has entered service was seen operating a Eltham rail replacement express service on Tuesday morning (did not see rego). Fleet lists note both #157 (BS03LP) & #158 (BS03LQ) on the road. Meanwhile I saw #155 (BS03LN) doing a 246 through St Kilda early this afternoon. Bus 154 (Scania/Gemilang) has entered service, was seen along Hoddle Street last Friday heading towards the CBD in the evening peak. PTV Live travel updates wrote: Due to service disruptions on the Manningham Loop Route 282, passengers are advised to catch Route 280 instead until the last service on Sunday, 13 May. Due to service disruptions on the Manningham Loop R282, customers are advised to catch Route 280 instead, until further notice. Apologies for the inconvenience. I presume this is due to vehicle reliability issues? I find it mind boggling they still have a contract. It would appear there are still some problems. Agreed Scott.The service levels and adherance to their contracts is just woeful. Equally, most parts of the route are accessible from other more frequent and direct routes nearby (eg, Doncaster Rd, Blackburn Rd, High St, etc). This is most likely the reason the route isn't overly well patronised given most main roads in Doncaster and Templestowe get double the frequency. Ultimately though, I don't completely blame Transdev. As the saying goes, laws are only as good as their enforcement, and so are contracts. If the PTV can't or won't enforce the Transdev contract, then why blame Transdev for not adhering to it as it is clearly optional? The contract is available online and if nothing else Transdev have clearly breached the sections relating to bus safety based on the fact in service buses have been withdrawn immediately after TSV inspections. Given there were some sneers about the travails at Dee Decker which is fundamentally a small operator operating charter and small number of school services, I find it absolutely amazing that similar travails regarding in-service everyday route buses transporting large numbers of the general public and a much larger number of school kids then Dee Decker somehow don't seemingly attract proportionally serious outrage and opprobrium, not to mention serious censure in the media! Yet I don't hold out hope for improvement. Both major parties (ie, electable ones) have blood on their hands with the Transdev contract, hence are unlikely to make much of a fuss about the unreliable and potentially unsafe mess that is Transdev. Additionally most patronage is on rail (train and tram) and hence "worthy" of political focus at elections whereas buses, regardless of costing more in subsidies despite the larger expense of running trains and trams, are of minimal interest due to perceived electoral disinterest and lower patronage. Hence there is no political interest in trying to win bus passenger votes and hence decisions like converting bus lanes to general traffic lanes (Fitzsimmons Lane currently and previously Stud Rd and Springvale Rd post-Eastlink) and not promoting bus priority in busy corridors (northbound Hoddle St). Plain white 717 headed north through Greensborough on a route 901 around 7.15pm tonight. 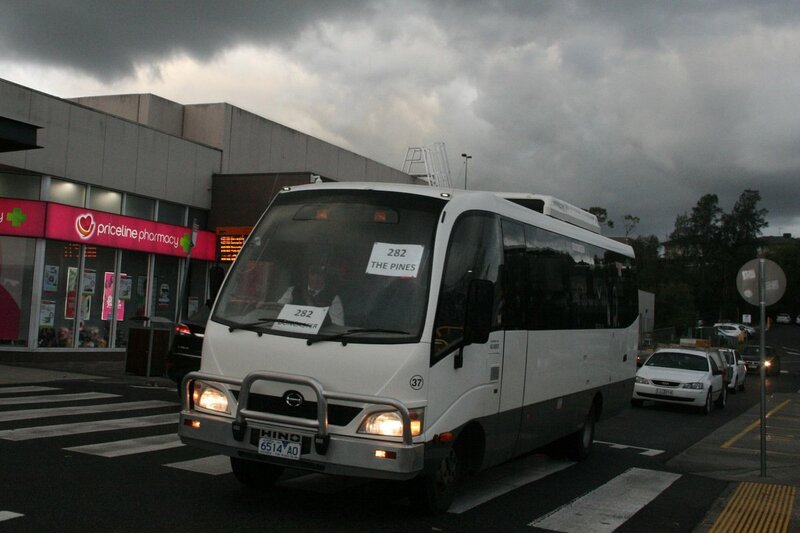 krustyklo wrote: Plain white 717 headed north through Greensborough on a route 901 around 7.15pm tonight. Reported elsewhere this was used on rail replacement on the Craigieburn Line last night. But well spotted! I am not exaggerating about the cancellation rate - waited at Tunstall Square this morning with no sign of 10:39 or 11:09 282 services nor 10:45 280 service. This meant the 282 bus was effectively coming every 90 min (i.e. 2/3 trips cancelled). Amusingly, both TDM and Mees drivers waited to changeover phantom trip at 11:09! TDM driver was then told to go back to depot! 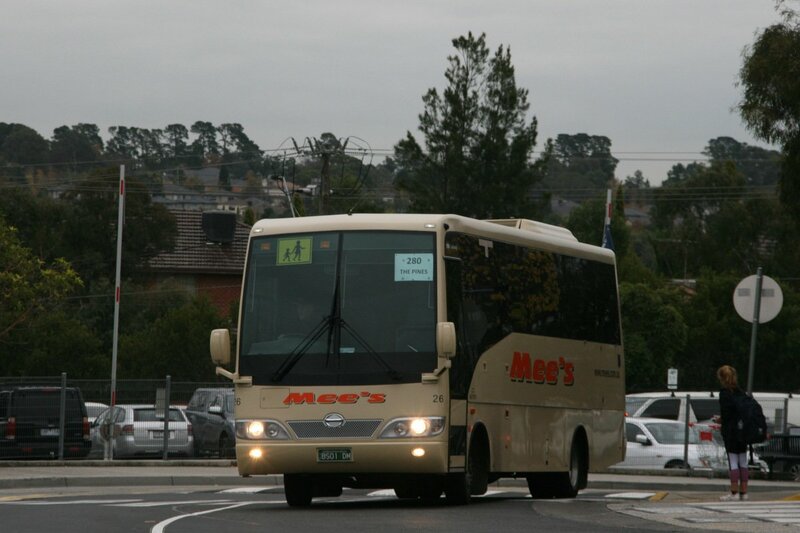 Two vehicles were out from Mee's today, the second transferred from their Benalla Bus Lines operation. Both seen at The Pines below. A TRANSDEV bus driver says the operator’s ongoing commitment to provide rail replacement services is leading to cranky customers and stressed out drivers. Transdev insists it has enough buses to meet commuter requirements after a recent acquisition of 35 new vehicles. But the driver told Manningham Leader on condition of anonymity that the company newsletter “says those buses are mostly to allow 20 older ones to be used for rail replacement and retirement of older buses”. Transdev uses buses not needed for regular daily services to provide for rail replacement from its fleet of 500 mostly State Governmentowned vehicles. It has a contract with the government to operate bus routes around Melbourne, including throughout Manningham, which has no trams or trains. It also has a contract with Metro Trains to provide the replacement buses when needed. The driver said Transdev was “doing very little” and driver morale was “very low”. Transdev Melbourne managing director Warwick Horsley said they had “a strong commitment to improving staff engagement and our credentials as an employer of choice”. “As part of this we regularly seek feedback on our performance from our employees. Pleasingly, our staff engagement scores have increased from 35 per cent in 2016 to 51 per cent in 2018. We recognise there is much more to do, and we are maintaining a strong focus on this area,” he said. This to some extent explains the sighting of the plain white 717 on the 901. It appears that the twenty reserve buses will also cover Transdev's runs when they are short of serviceable buses. I would be more worried with Management finding pleasure in seeing only a 51 per cent staff engagement score!! After all, the drivers are the ones keeping your business moving. Transdev's management's response it just more spin. You get dizzy just reading it. Maybe time to roll the current management and bring in some new blood. Better still.Roll the companies metro contract and source other bus operators who have the commitment and capability to operate their contracts properly. And one thing is that the fleet of Optares are only 2016 vintage, so not that old, yes vehicles may have issues, but it should not cause problems like this. Resigned on his own terms, or pushed? The third head of TDM to fall since the contract started I might point out. Craig wrote: I am not exaggerating about the cancellation rate - waited at Tunstall Square this morning with no sign of 10:39 or 11:09 282 services nor 10:45 280 service. This meant the 282 bus was effectively coming every 90 min (i.e. 2/3 trips cancelled). Amusingly, both TDM and Mees drivers waited to changeover phantom trip at 11:09! TDM driver was then told to go back to depot! It’s just as bad in the West. I live not far from Central West Plaza on Ashley St, making Route 220 my closest route. I can’t recall the amount of times I’ve waited for buses that never show up. Even just last week I waited for the 0809 Gardenvale which didn’t show up, nor did the 0817, 0825 or the 0832. I ended up just walking to Tottenham and getting the train to Sunshine. In the midst of this, two TDM Smartbus vehicles drove past. And this is a common occurrence. That same day an unknown CR222L was broken down in the middle lane of Ashley St outside Braybrook plaza. Mitch wrote: It’s just as bad in the West. I live not far from Central West Plaza on Ashley St, making Route 220 my closest route. I can’t recall the amount of times I’ve waited for buses that never show up. Even just last week I waited for the 0809 Gardenvale which didn’t show up, nor did the 0817, 0825 or the 0832. I ended up just walking to Tottenham and getting the train to Sunshine. In the midst of this, two TDM Smartbus vehicles drove past. And this is a common occurrence. With 220 the main(but not only)reason of delays are due to congestion issues & to lesser degree sometimes tight layover. Which some then results in trips missed or partly missed. Though it might seem bad be thankfully you weren't using it pre 2014 when gaps would of been over 30 minutes and even up to an hour due to late running issues & old extermley tight run times. Apart from fleet issues, the 220 along with 216/219 are about hardest runs to get high punctuality & reliability. The run time changes in 2014 & 2016 saw some very good improvements but still not exactly achieving high levels. To improve punctuality further the proposed route split will help but even that won't be a silver bullet. Really need some bus priority (along measures already in place i.e improved run time & proposed route split)in at least at worst spots where the length of delays varys from day to day. scott wrote: Resigned on his own terms, or pushed? Given the bullet I understand.